When volunteers take over work that used to be done by government employees, it’s often controversial, especially when unions are involved. But for certain jobs, it’s actually better for community volunteers to do the work, even if there’s plenty of money to pay for it. Case in point: San Jose’s forlorn Municipal Rose Garden. Mowing the grass, pruning big trees and maintaining walkways and fountains in the 5.5-acre regional park west of downtown would be too much for volunteers alone to do. But taking care of those 3,500 once-beautiful roses? That’s a no-brainer. Why? Because caring for roses is a labor of love. Just ask the 150-plus volunteers who turned out last weekend to help rescue the garden, which is threatened with decertification by All-America Rose Selections because it no longer meets national standards. Even if San Jose could afford an army of paid gardeners for the park, it will look better and provide much more joy if volunteers take care of it. On Tuesday night, the San Jose City Council will look at ways to make it easier for businesses, homeowner associations and volunteers to adopt parks and do other work the city no longer can afford to do well. Some proposals that raise the issue of prevailing wages for any hired hands are understandably controversial, and we’ll talk about them on Tuesday’s editorial page. But simply making it easier for volunteers to help out is part of a fundamental and necessary shift from expecting government to do everything toward a model of personal stewardship. Taking responsibility for parks and other public facilities can empower residents and increase community pride. The volunteers who already have worked to paint out graffiti, plant trees or build playgrounds in San Jose value community assets more. City management has been moving this way over the past few years and now is actively looking for more community partnerships. Putting them together and recruiting and managing volunteers is hard work. It will require more city investment in some areas, but the costs will be justified as they leverage volunteer labor and build a more involved community. A comparison of San Jose’s two rose gardens makes the case. The historic Municipal Rose Garden on Naglee Avenue is the one that’s struggling. A few miles away is its thriving counterpart, the Heritage Rose Garden, founded in the 1990s to preserve and showcase rose specimens. The heritage garden’s nearly 5,000 bushes were planted and are maintained with 100 percent volunteer labor through the Friends of the Guadalupe River Park and Gardens, where it’s located. Lucy Perez is the part-time volunteer coordinator who keeps it humming. 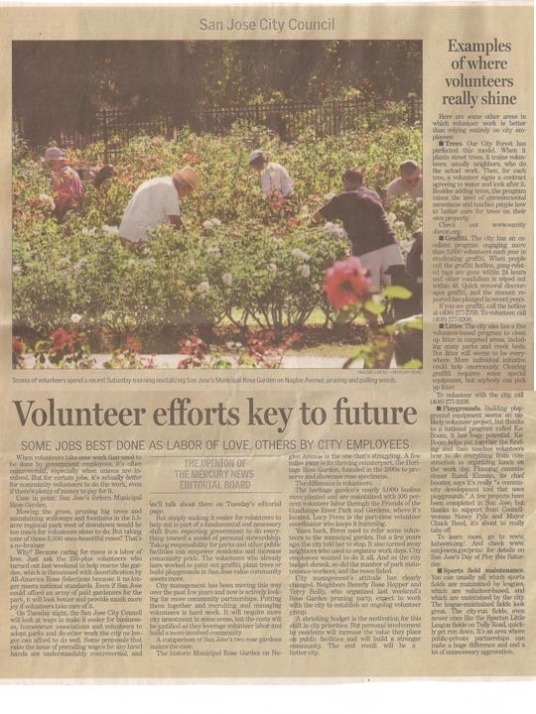 Years back, Perez used to refer some volunteers to the municipal garden. But a few years ago, the city told her to stop. It also turned away neighbors who used to organize work days. City employees wanted to do it all. And as the city budget shrank, so did the number of park maintenance workers, and the roses faded. City management’s attitude has clearly changed. Neighbors Beverly Rose Hopper and Terry Reilly, who organized last weekend’s Rose Garden pruning party, expect to work with the city to establish an ongoing volunteer group. A shrinking budget is the motivation for this shift in city priorities. But personal involvement by residents will increase the value they place on public facilities and will build a stronger community. The end result will be a better city. – BYLINE: San Jose Mercury News, Calif.